Click here to see the full fact sheet pdf. As consumers age they can face increased risk in the financial marketplace, and predatory businesses may target them with misleading ads, unfair fees, and overpriced or unnecessary financial products. A new analysis shines light on these issues, finding that through July 2017, older Americans had submitted at least 72,000 complaints to the Consumer Financial Protection Bureau, also known as the Consumer Bureau. 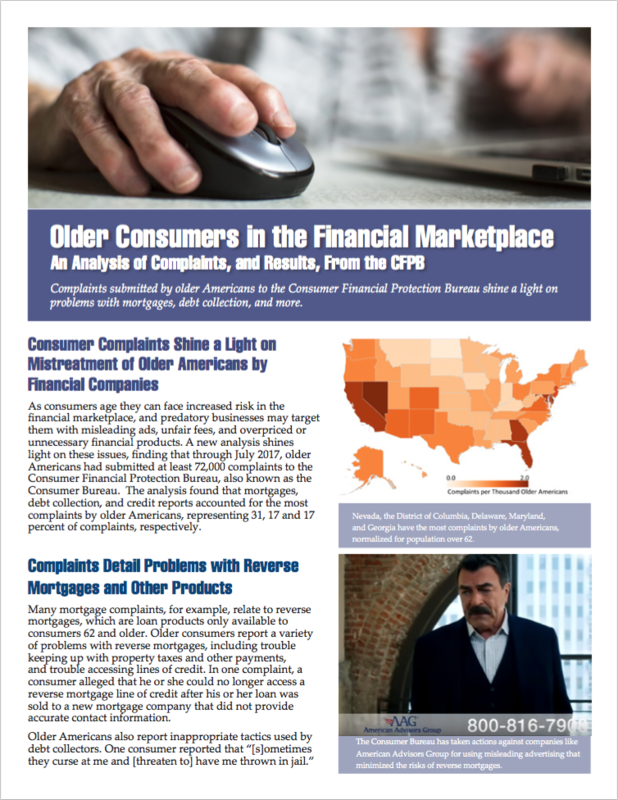 The analysis found that mortgages, debt collection, and credit reports accounted for the most complaints by older Americans, representing 31, 17 and 17 percent of complaints, respectively. Many mortgage complaints, for example, relate to reverse mortgages, which are loan products only available to consumers 62 and older. Older consumers report a variety of problems with reverse mortgages, including trouble keeping up with property taxes and other payments, and trouble accessing lines of credit. In one complaint, a consumer alleged that he or she could no longer access a reverse mortgage line of credit after his or her loan was sold to a new mortgage company that did not provide accurate contact information. Scammers may look to take advantage of older consumers’ savings, home equity, or guaranteed income. These include scammers peddling fake products or charities, mortgage companies promising easy cash through refinancing, or investment brokers peddling inappropriate high-risk investments. As consumers age, their vulnerability can increase as a result of cognitive decline, isolation, disability, or the recent loss of a loved one. These conditions can make older consumers more susceptible to misleading advertising, or more prone to misunderstanding confusing terms or fee schedules. A study from the American Journal of Public Health estimated that each year, more than one in 20 older Americans are affected by financial scams or fraud. 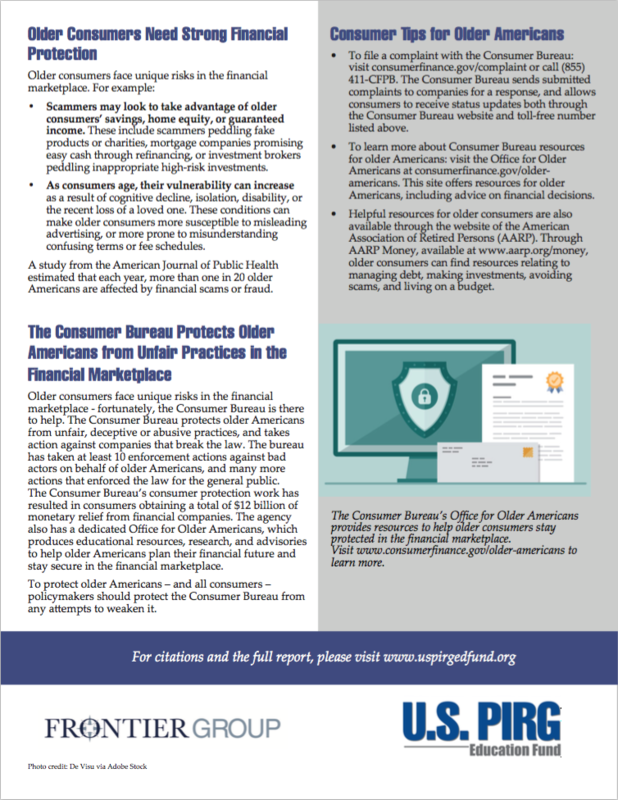 Older consumers face unique risks in the financial marketplace - fortunately, the Consumer Bureau is there to help. The Consumer Bureau protects older Americans from unfair, deceptive or abusive practices, and takes action against companies that break the law. The bureau has taken at least 10 enforcement actions against bad actors on behalf of older Americans, and many more actions that enforced the law for the general public. The Consumer Bureau’s consumer protection work has resulted in consumers obtaining a total of $12 billion of monetary relief from financial companies. The agency also has a dedicated Office for Older Americans, which produces educational resources, research, and advisories to help older Americans plan their financial future and stay secure in the financial marketplace. To protect older Americans – and all consumers – policymakers should protect the Consumer Bureau from any attempts to weaken it. To file a complaint with the Consumer Bureau: visit consumerfinance.gov/complaint or call (855) 411-CFPB. The Consumer Bureau sends submitted complaints to companies for a response, and allows consumers to receive status updates both through the Consumer Bureau website and toll-free number listed above. To learn more about Consumer Bureau resources for older Americans: visit the Office for Older Americans at consumerfinance.gov/older- americans. This site offers resources for older Americans, including advice on financial decisions. Helpful resources for older consumers are also available through the website of the American Association of Retired Persons (AARP). Through AARP Money, available at www.aarp.org/money, older consumers can find resources relating to managing debt, making investments, avoiding scams, and living on a budget. The Consumer Bureau’s Office for Older Americans provides resources to help older consumers stay protected in the financial marketplace. Visit www.consumerfinance.gov/older-americans to learn more.